In what can only be described as an act of monumental political arrogance, Oregon’s public employee unions have cast Republican gubernatorial candidate Ron Saxton as “Public Enemy #1.” In doing so they have made the 2006 gubernatorial election a referendum on the power of the public employee unions. This is no longer an election pitting Ted Kulongoski against Ron Saxton; this is an election pitting the public employee unions against Ron Saxton and Oregon’s taxpayers. So be it. First, understand the power of the public employee unions. Each year, the state of Oregon forwards to the public employee unions about $14.5 million withheld from public employee payroll checks. That creates a war chest of $29 million each election cycle, collected for the public employee unions by the state. Add to that an equal amount based on the sheer number of county, municipal and school employees, and the figure grows to nearly $58 million collected by government and forwarded to the unions to use as they see fit. Granted, such amounts must also pay for recruiting, organizing and collective bargaining. But because you have to join the public employee unions in order to work for all levels of government, the concept of recruiting and organizing exists in theory but not in reality. Because the public employee unions are accountable to no one in how they spend their vast sums of money, one can safely assume that the vast majority is spent on politics—lobbying, political education, political research, polling, candidate recruitment and training, candidate support or opposition, and ballot issue support or opposition. Anything where a vote of the people could challenge their political dominance. 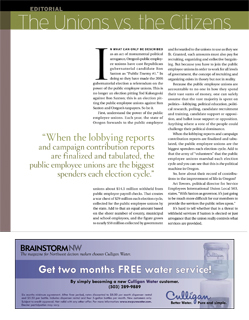 When the lobbying reports and campaign contribution reports are finalized and tabulated, the public employee unions are the biggest spenders each election cycle. Add to that the army of “volunteers” that the public employee unions marshal each election cycle and you can see that this is the political machine in Oregon. So, how about their record of contributions to the improvement of life in Oregon? It’s hard to tell whether that is a threat to withhold services if Saxton is elected or just arrogance that the union really controls what services are provided. The public employee unions’ record of achievements is short and self-centered. They brought us PERS, which allows public employees to retire at age 55 with a taxpayer-funded pension in excess of what they were earning while working. The net effect of that is to encourage public employees to retire early and to force the taxpayers to not only fund their exorbitant pensions but also to fund the replacement salary of the person who is hired to do their work. The PERS problem is so great that it was tagged at $13.5 billion at the beginning of the 2003 legislative session. Today, state and local government units are paying an approximate 20 percent surcharge to fund this outrageous system. It’s hard to forget the picture of the laughing, partying recent retirees that ran in the state’s largest newspaper. Oregon’s public education system is in shambles. Salaries, benefits and work rules are dictated by the ever-vigilant and powerful public employee unions. Oregon continues to pay more than the national average on a per capita student basis for K-12 education and far more than neighboring states such as Washington, Idaho, Utah, Nevada, and Arizona. Yet its academic performance is mediocre at best, based on national averages. Oregon has one of the highest drop-out rates in the nation. The public employee unions are staunch opponents of educational accountability and teacher merit pay. They are routinely in the vanguard to support higher taxes in order to increase the amount of money available to an inefficient educational system. To be sure, the public employee unions have two goals: increase the number of public employees hired, and increase the pay and benefits of those employees without limits. As they achieve those goals they have more money to spend on political dominance. The public employee unions view government as their open checkbook. And what about Kulongoski? He has promised to spend more money and to veto any attempts to reform the abusive PERS system. Maybe it’s time to find out whether Oregonians want to run government for the benefit of the public employee unions or for the benefit of the citizens.